Day 3 of the 31 Day Challenge is yellow, and I had a really hard time coming up with an idea for this one. I don't wear a lot of yellow polish, and I really only have two or three truly yellow polishes in my stash of over 500. I was very tempted to recreate my bumblebee manicure but wanted to try something new. After coming up with and dismissing several different ideas, I finally realized that the perfect yellow manicure had been staring me in the face the whole time! And I do mean that literally, as this has been the show I have been watching while I paint my nails the last couple of weeks. I have been a pretty big Pokemon fan since back in the good old days of Pokemon Red and Blue. For Christmas, Becky got me the entire first season on DVD and I have been happily enjoying the nostalgia of what used to be one of my favorite cartoons as a kid. What better yellow nails than some Pikachu nail art? I used Nicole by OPI One Voice as my yellow base, and Zoya Tamsen, Zoya Raven, and Zoya Purity for the red, black, and white. For the pokeball, I started off with a base of Tamsen and added Purity to the lower half, followed by a strip of black and a rhinestone in the middle. I got a lot of comments on these nails - from my residents, fellow students, nurses, the lady at the coffee shop... the two days I wore these I think I had around 15 people stop me and tell me how much they loved my nails. Only half of them knew it was Pokemon without being told.. but that's okay, haha. Loved this manicure a lot (although I clearly need to figure out how to put topcoat on dots without smearing them). So much fun! If you are interested in a tutorial on this or any look, don't hesitate to ask (although this one is fairly straight forward). Don't forget to check out Becky's blog to see what she came up with for Day 3! I will have Day 4, green for you on Sunday, St. Patrick's Day! Hello all! Orange didn't end up being a very hard prompt for me - it only took me a few seconds to settle on a design that I have been wanting to try for quite awhile, but never had the proper tools (or the confidence) to actually try. This look has been done by many others and I am glad to have finally recreated my own version! I really love how these turned out, especially with the gradient! I think after doing this once I am getting a better feel for how to use the striping brush well, and it makes me want to totally recreate the look because I think I could do a much better job, haha. Maybe this summer! It was a lot easier than I thought it would be, and aside from horribly smearing some of the dots, I really loved it. 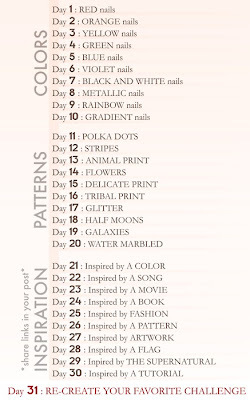 Also, my starting the 31 day challenge prompted my sister Becky to do it along with me! We are a bit off-synch right now but we'll probably get caught up soon. Check out her day one nails! Now I'm off to brainstorm what do to for day three... check back Friday to see what I come up with! After years of wanting to jump into this challenge and not feeling ready, I have finally decided to take the plunge - with a caveat. 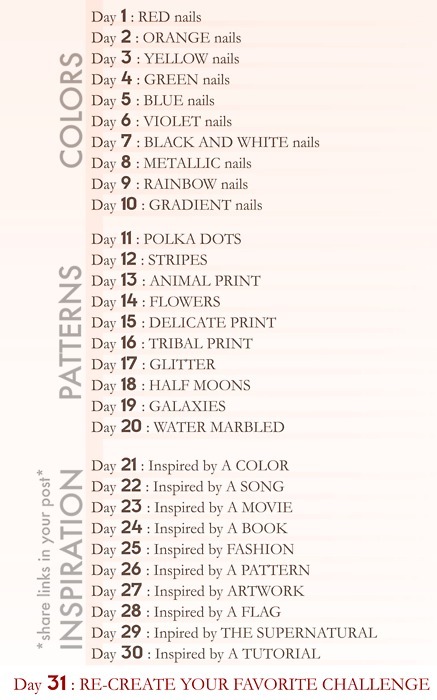 Since my schedule is a bit too hectic to paint my nails daily, I won't actually be completing this in 31 days. However, it will still hopefully serve to inspire new creative nail art and I am super excited! So let's get going... day one is red! For this challenge I decided to do a fun ladybug manicure - I am in the mood for spring and this was the perfect way to express that on my nails! I started off with two coats of Zoya Tamsen, and then used Zoya Raven and Zoya Purity for the details. I finally got the nail art brushes I ordered quite awhile ago and I was excited to get to try them out! They are definitely easier to work with than the brushes I was using before. These little guys were super cute and I got an awful lot of comments on them - even from some of my patients, which was fun. It is getting a bit warmer here and almost all of the snow from Snowmageddon 2013 has melted... bring on spring! Although I was not a huge fan of "spring forward" daylight savings time yesterday. Ugh - I much prefer "falling back" in that regard. Anyway, if you want to recreate the look, here is a little tutorial I put together! Check back Wednesday for Day 2 - Orange! Today I want to share with you all a basic stamping manicure using two of the blue shades from the new OPI Euro Centrale collection. When I first saw these two sitting next to each other, I knew they would make great stamping buddies! I started off with two coats of OPI Can't Find My Czechbook and added the design using OPI I Saw... U Saw... We Saw... Warsaw and plate m60, one of my very favorite Konad designs. The colors go perfectly together, as they both have a touch of green and dustiness to them. These two were already some of my favorites of the collection but I like them even more now that I have seen them together - definitely a combination I can see myself using again! 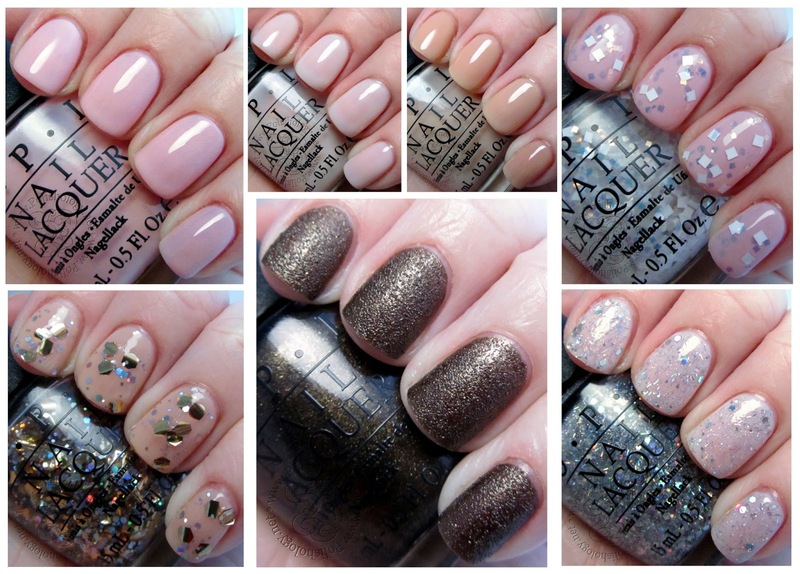 Click here for swatches of these polishes (and others of the collection). Have an awesome day!